You can adjust the brightness of a video (relative lightness) and the difference between the darkest and lightest areas of a video (contrast). Under Video Tools, on the Format tab, in the Adjust group, click Corrections, and then under Brightness/Contrast, select the option that works best with your video. Tip: Move your mouse pointer over the recolor effects. The Live Preview feature in PowerPoint lets you see what your video will look like with that recolor effect applied to it before you click. When you open the Corrections panel, you’ll see that the brightness and contrast are set to Normal. You can change that here. 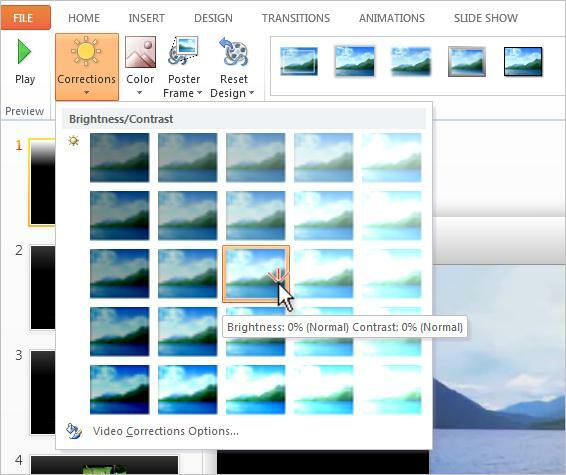 Under Video Tools (in version 2010) or Movie Tools (in versions 2007), on the Format tab, in the Adjust group, click Brightness. Select the brightness setting that you want. Under Video Tools, on the Format tab, in the Adjust group, click Contrast. Select the contrast setting that you want. On the Video Format tab, in the Adjust group, click Corrections, and then under Brightness/Contrast, select the option that works best with your video.